Glary Utilities Pro is a powerful and top all-in-one PC tune-up utility which offers numerous powerful and easy-to-use system tools and utilities to fix, speed up, maintain and protect your PC. It allows you to clean common system junk files, as well as invalid registry entries and Internet traces. You can manage and delete browser add-ons, analyze disk space usage and find duplicate files. You can also view and manage installed shell extensions, encrypt your files from unauthorized access and use, split large files into smaller manageable files and then rejoin them. Furthermore, Glary Utilities includes the options to optimize memory, find, fix, or remove broken Windows shortcuts, manage the programs that start at Windows startup and uninstall software. Other features include secure file deletion, an Empty Folder finder and more. Glary Utilities Pro is designed to be as simple and intuitive as possible. The main application window is neatly arranged and consists of 3 tabs including “Overview,” “1-Click Maintenance” and “Advanced tools”. By default you’re gonna see the Overview Tab. This tab includes some configuration options (turn on or turn off automatic maintenance, privacy tracks erasure, deep clean & fix, and software updates, etc. ), shows last Windows boot time recorded, as well as immediate access to Startup Manager for disabling unnecessary startup programs to make Windows boot faster, and also shows program information, such as current version, database date, last update and license type. 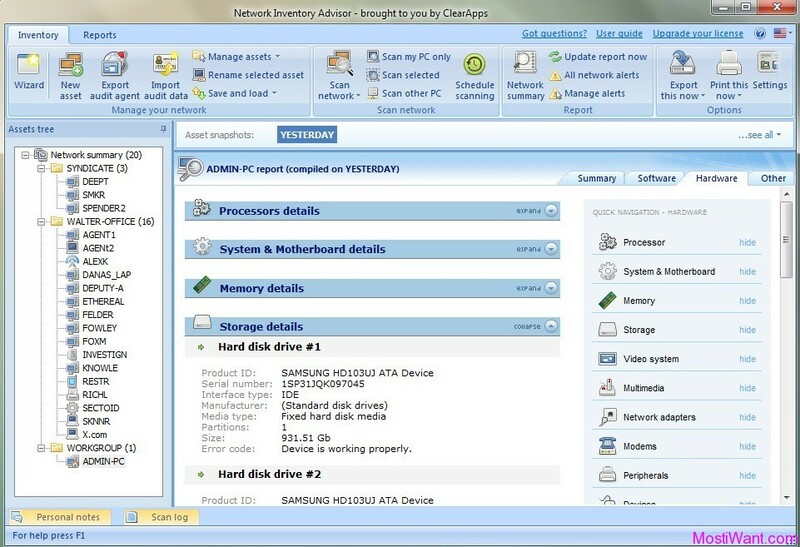 The 1-Click Maintenance tab will scan the computer system for various problems and spyware. The main advantage of this over the individual modules is the ease of use. Five of the seven possible scan options are selected by default. The computer user can make individual selections to add or remove options from the scan. 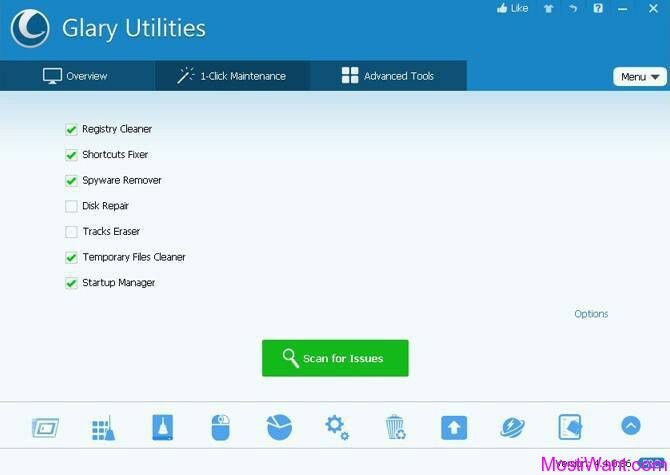 All Glary Utilities modules can be found in the Advanced Tools tab, where they are broken down into five categories: Clean Up & Repair, Optimize & Improve, Privacy & Security, Files & Folders, and System Tools. 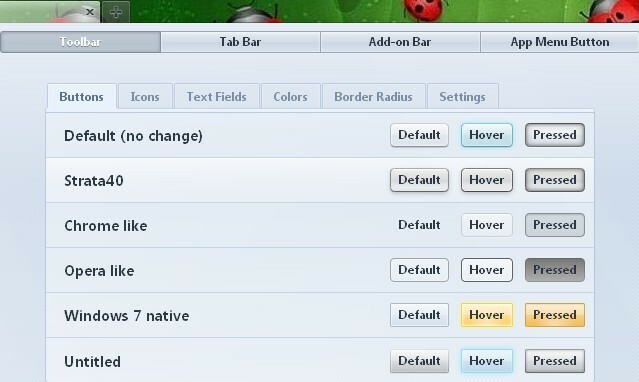 There tools are also accessible from the bottom part of the software interface (via icons). 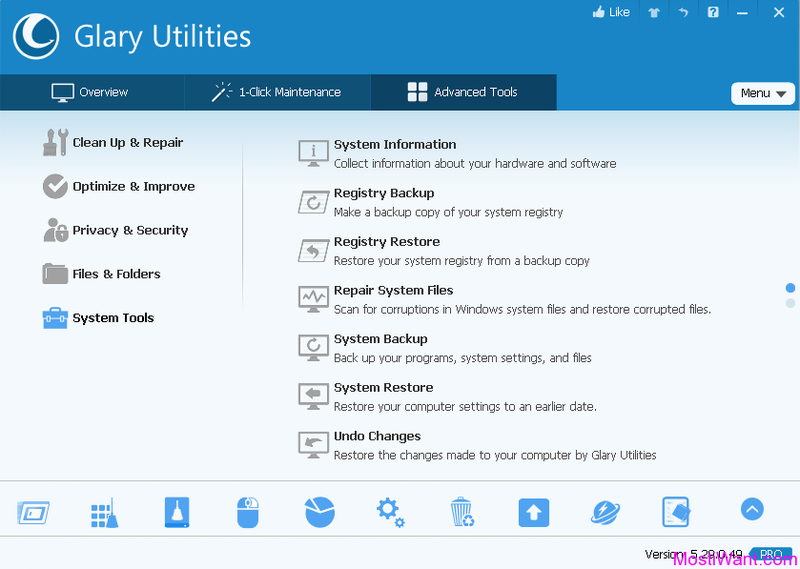 To further optimize its security functions, Glary Utilities Pro offers a simple backup and restore feature. The program itself creates backups when necessary and stores them with a short description and the time they where created. Using the backup function you can reverse all changes made to the the Windows registry or important changes of the system configuration. Redundant files (e.g. temporary files), however, are not backed up here. Glary Utilities Pro is very simple and easy to use. It takes just one click to use Glary Utilities Pro. As if by magic, your old PC will transform into a brand new and blazing fast one after Glary Utilities’s automatic cleanup and tune-up. Adopted new advanced algorithms, Glary Utilities Pro now able to provide extremely fast scanning speed when compared to similar utilities. All in all, although there are countless numbers of system care and cleaning utilities around for Windows, Glary Utilities Pro managed to stand out from the rest thanks to its dead easy use interface, blazing fast speed, and overall effective health care for your PC. Glary Utilities Pro Edition normally charges $39.95 per license code / registration key (1 year subscription for up to 3 PCs, discounted to $27.96 right now). But in cooperation with Glarysoft Ltd, we can offer Glary Utilities Pro 5.29 (latest version) completely FREE to our visitors for the next 72 hours! Interested users just need to visit this link to download the giveaway package. Unzip the package you’ve downloaded, you can find the giveaway installer, and your free license code in the Readme.txt file. I would be very appreciate if you could “Like” Glarysoft On Facebook, or if you could share this giveaway offer on your blog or any social networking site of you choice. At last, Thanks Antonia from Glarysoft for taking interest in to this blog and arranging the Giveaway for my readers. If I upgrade my Windows 7 laptop to Win 10, will the license still be valid? yes, it will still be valid. Thanks a lot William and Glarysoft for the nice giveaway. From my past experience, any name works as long as the license works. Thank you very much. When used with caution (as stated by ‘Charlie'(thank you Charlie)), this is an excellent program. thanks a lot William. Also thanks glarysoft. nice giveaway. Dear raju, the code is displayed in the giveaway post. Excellent app! Thank you very much indeed! AWESOME THX VERY MUCH M8.